N2O4/Aerozine-50 propellant rocket stage. 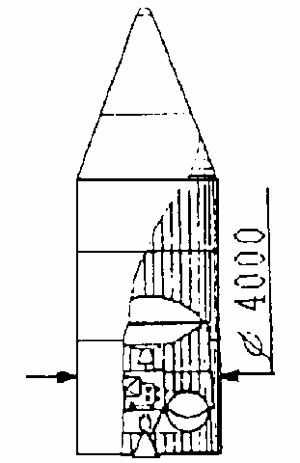 Empty mass estimated (rounded figures given in source material indicates impossible 9 metric tons gross with 8.7 metric tons propellant). AKA: Space Block. Status: Study 1961. Thrust: 117.00 kN (26,302 lbf). Gross mass: 9,400 kg (20,700 lb). Unfuelled mass: 700 kg (1,540 lb). Specific impulse: 350 s. Burn time: 350 s. Height: 5.00 m (16.40 ft). Diameter: 4.00 m (13.10 ft). Span: 4.00 m (13.10 ft). Country: Ukraine. Engines: RD-280. Launch Vehicles: R-56. Propellants: N2O4/Aerozine-50.